To restart BlueStacks, you have to follow simple steps. The restart is necessary because it refreshes all of the needed files. 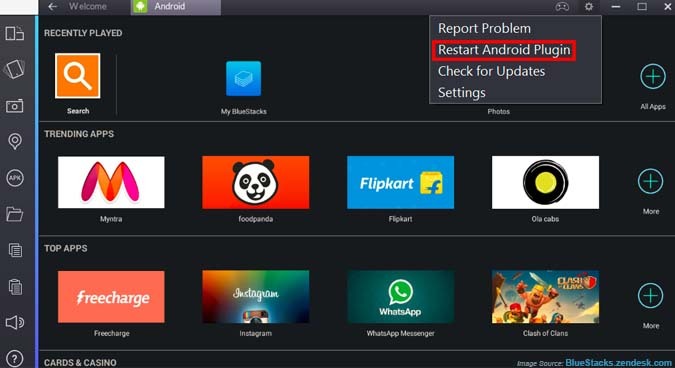 Check out the following steps with images, if you want to relaunch BlueStacks App Player. 1- To restart Bluestacks 2 you have to click on the Settings or Gear Icon. From the Drop-down, click on the “Restart Android Plugin”. This will restart your BlueStacts 2 if this method doesn’t work for you can try the second method. This method is also for BlueStacks 2, click on ‘PC TRAY icon’ as you can see in the image below. Now right click on the BlueStacks icon and select QUIT. Finally, now launch the BlueStacks from the launching icon on the desktop, or from where it is installed.